Eras of Britain’s political economy come and go. They ebb and flow, driven by political and economic cycles. Sometimes shifts are hard to see at the time, particularly when they are obscured by the political fog of war. Or Brexit, as it’s currently known. But noticed or not, the financial year starting this Saturday will mark the end of an era – bringing the curtain down on the post-financial crisis austerity of David Cameron and George Osborne. It will mark the end of an era because it will be the last year we see the three components of the post-crisis economic policy framework in action – cuts to many public services, a retrenchment of social security, and significant income tax cuts that increase the heavy lifting required of the first two. On public services the year to come is the final one of George Osborne’s Autumn 2015 spending review. This means unprotected departments, not prioritised like the NHS, continuing to see major cuts. The Ministry of Justice and HMRC both face cuts in spending per capita of just over 8 per cent, on top of reductions of 48 and 37 per cent respectively since 2009-10. On Saturday the Income Tax Personal Allowance (PTA) and Higher Rate Threshold (HRT) will increase to £12,500 and £50,000 respectively, at a cost of £2.8 billion. These build on a series of such tax cuts since 2011. This year’s will, however, be particularly heavily skewed towards higher earners – with the large HRT rise taking up almost half the long-run cost. Indeed, for basic-rate taxpayers the cut will be only worth £73, while a typical higher-rate taxpayer will gain £327 – over four times more. PTA increases have also become more regressive over time, with further increases to the amount you earn tax free not much use to the four in ten working-age adults who already don’t pay it. Overall 85 per cent of these tax cuts will go to the top half of families by income, with over a third (35 per cent) going to the top 10 per cent alone. 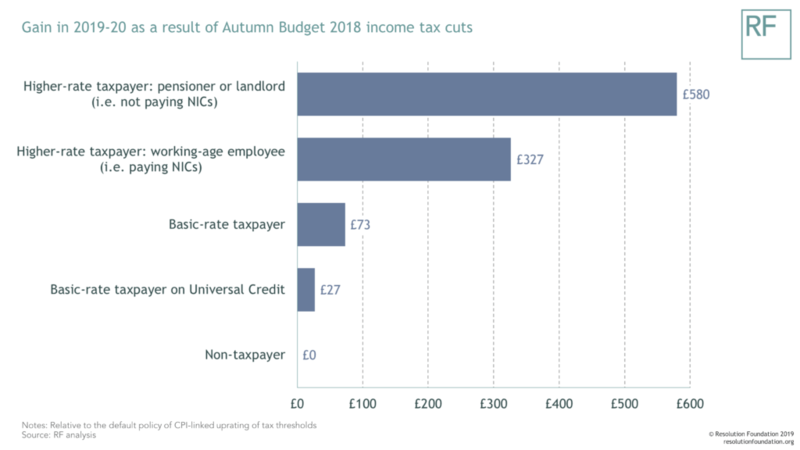 If tax cuts are giving to the top, this year’s benefits cuts are certainly taking from the bottom. It’s the final year of the four year benefit freeze – affecting around 10 million households. This will cost poorer couples with children an average of £400 next year, and cutting £1.8 billion overall, rising to £900 a year and £4.7 billion once we take into account the full four year freeze. We can bring together all new tax and benefits changes, including over 4 per cent council tax increases, frozen fuel duty and welcome Universal Credit work allowance increases. The result is very regressive. 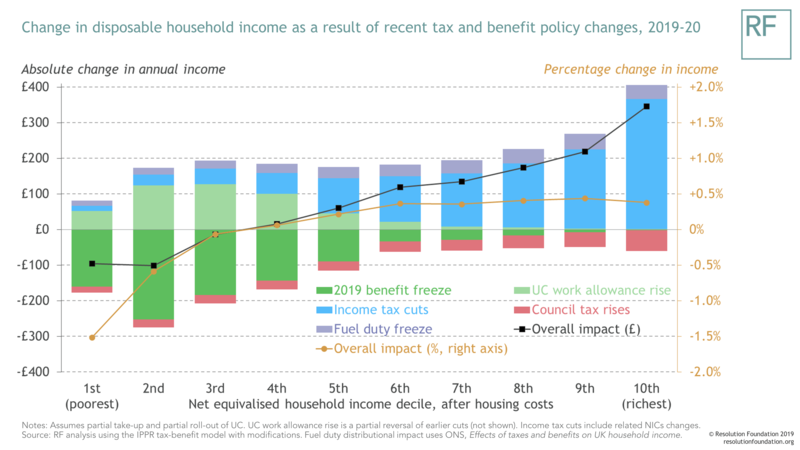 New policies in 2019-20 will boost incomes by an average of £280 for households in the top fifth of the income distribution, but reduce them by £100 for those in bottom fifth. All of this should remind us that policy really does matter when it comes to household living standards. But while these changes are a continuation of the current era, they are also a big bang end to it as the fiscal position improves and austerity fatigue sets in. The post-crisis approach was driven by anxieties about a near 10 per cent deficit in 2009. But the tax take now exceeds day-to-day government spending and the Chancellor has £35 billion of headroom in 2022-23 against his target to borrow less than 2 per cent of GDP (or perhaps £22 billion post student loan accounting changes). While debt remains twice its pre-crisis levels, eight years on from deficit reduction beginning the political appetite for it has fallen away, just as it did eight years after the 1990s recession. Meanwhile the academic consensus has become decidedly more relaxed about public debt. Social security retrenchment in terms of new policy is certainly over, both in terms of public opinion and political choices. Recent years have seen increases in the proportion of people that support increased benefits. Labour has firmed up its opposition to benefit cuts, having largely ignored them in the 2017 Manifesto, while the last five of the fast churning Secretaries of State for Work and Pensions have committed to no further social security cuts. On tax cuts, it’s not just Conservatives coming to the end of an era. Income and corporation tax cuts have been a common theme of British politics for 40 years. The Labour Government cut the headline rates of both these taxes, and post-2010 the wish to offer tax cuts underpinned the extraordinary focus on spending restraint to drive post-crash deficit reduction. Indeed, the range of tax cuts introduced since 2010 – to income tax, corporation tax and fuel duty – are expected to cost the government in the region of £40 billion next year. But the tide has turned. Neither main party competed on offering tax cuts in the 2017 election, with Labour setting out £49 billion of extra taxes, while Theresa May proposed the so-called dementia tax. And it’s not just our parties turning against tax cuts – substantially times have changed. 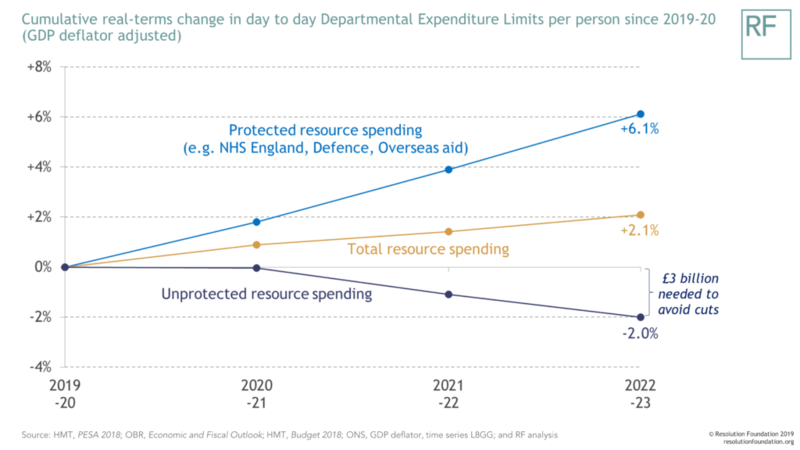 Our ageing society, plus rising healthcare costs, mean simply maintaining the welfare state we have today will cost an extra £36 billion a year by 2030. After nine years of austerity we can’t simply repeat the exercise – nor repeat the post-war exercise in growing the welfare state on the back of a shrinking military. In fact we already know the era of tax cuts is over. Next April the government already plans to freeze both the PTA and HRT, while ongoing freezes to the points at which we remove child benefit and the PTA from higher earners will mean these tax rises become more visible as more people are affected. The Spending Review that has to happen this autumn will also mark the end of departmental cuts. Philip Hammond has already declared that the ‘era of austerity is finally coming to an end’. Last year’s promise of £20 billion for the NHS by 2023-24 means that overall spending will be rising. Whoever is the Chancellor will only need to find £3.4 billion to ensure unprotected departments avoid real cuts, or £10 billion to grow them in line with the economy. The central row over public spending will not be pro- or anti-austerity, but how fast should the coming rises be, and how contingent should that be on the pace of post-Brexit growth. But although this era is coming to a close on taxes, benefits and spending cuts, its aftershocks will continue to be felt for some time. Policy impacts last – once you’ve dug a hole you’re still in it after you stop digging, as our prisons and local government will find for years to come. 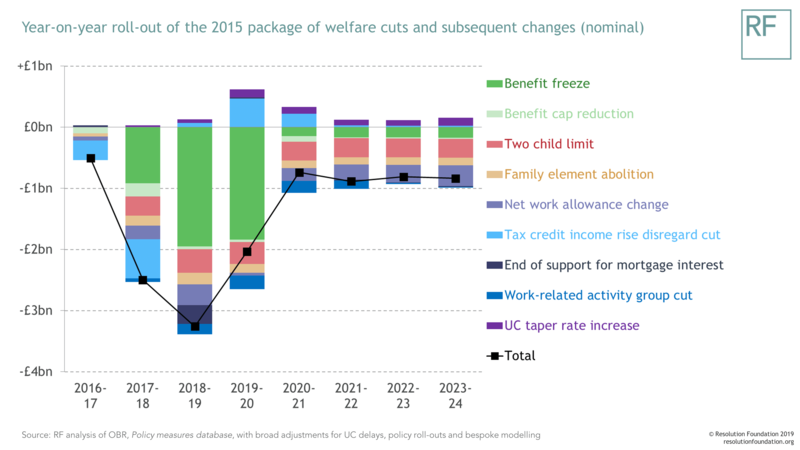 Benefit cuts that affect only the flow of new claimants means that, while no new cuts are in train, even after 2019-20 around a quarter of George Osborne’s 2015 benefit cuts are still to come, as the two child limit and family element abolition (worth over £500) are rolled out. 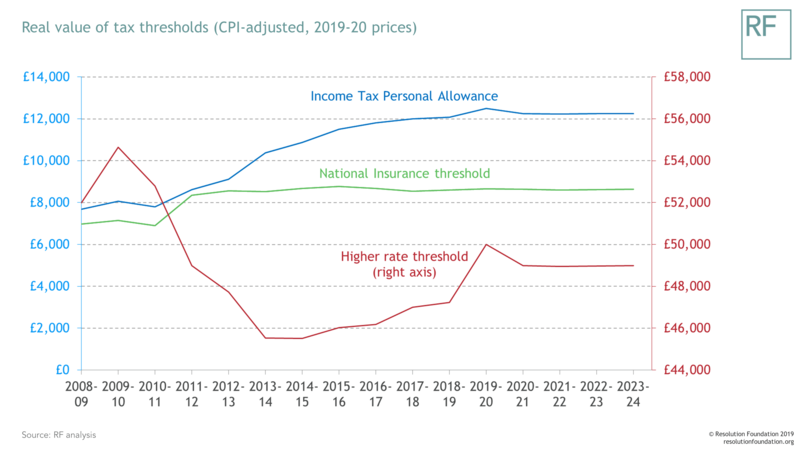 All tax and benefit policies introduced since 2015 mean that by 2023-24, the poorest fifth of households will be an average of £1,400 a year worse off. In stark contrast, the richest fifth will gain £300 on average. 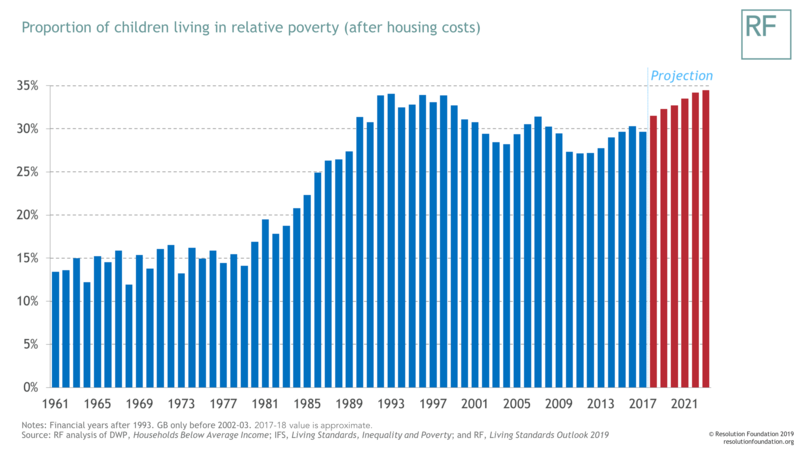 This era’s legacy is a big hit to the poor, with losses of around a staggering one-fifth of disposable income (after housing costs) for the poorest families. The result: child poverty is set to rise in the years ahead and risks hitting a record high (over 34 per cent) in the early 2020s. So on public services, tax and benefit cuts this year really is the end of an era. Theresa May thought she marked a change of era but, despite the rhetorical shift towards the just about managing, she has not been able to redirect our country’s political economy as Brexit rages. What the new era becomes will depend not just on Brexit, but on who the next Prime Minster is, and who forms the next government. The big questions then will be the extent to which falling debt replaces a falling deficit as the lodestar of fiscal policy and what we want our state to do, and how its maintenance, let alone any expansion, is funded. So as the UK shapes a post-austerity political economy and navigates Brexit there are lots of decisions to take. An era is coming to a close, but tough choices aren’t.